"Scientific truth does not triumph by convincing its opponents and making them see the light, but rather because its opponents eventually die and the new thoughts are accepted!" Dr. Jason Baasch is one of the main antagonists of Sword of Embera. 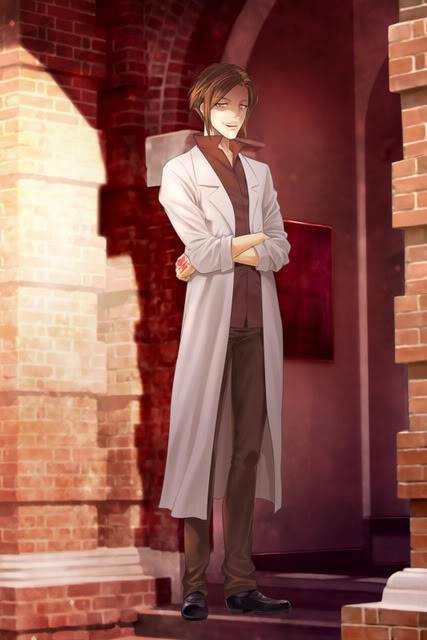 He is a scientist that believes that magic and science should be mixed together to form super weapons to assure that beings like Rane can never come to power again. He has designed several weapons that he plans too use on the Category to prove once and for all, that his vision of the world is the only correct one. He is a human with no faye ancestry. He had dreamed of joining the Category and entered the University with high notes. However, it was his methods of attempting to tamper around with the magics and weapons that got him in trouble. Since the defeat of Rane, there has been a dislike of intermingling the laws of nature with that of the supernatural. After creating several prototypes of clockwork robots intermingled with Embera magic, Jason had created an army for himself. The Category showed little interest in his advanced weapons and demanded that he stop making weapons of war. Jason refused to listen to these demands; believing that the upper levels of the Category were far too conservative. Therefore, he was kicked out of the Category. With his dreams dashed, he focuses largely on trying to manipulate people and supernatural beings just because he can, and it's fun. He holds no political affiliation, nor does he follow anyone else's orders. As far as he is concerned, his is the only opinion that matters and everyone else will follow his lead or die. This scientist fights for no cause except his own. Any affiliations with other groups are purely for the purposes of hiding his connections with crimes or having others do his dirty work. This is not to say he has no political views or agenda, just that they are kept seperate from his own personal ambitions. Getting people to follow his whims is one of his skills (though not always). His favorite hobby is analyzing and dissecting, usually for hours on end. Why did she say that to me, what is he really up to? He would love to get inside people's heads and know what's going on, even if it meant taking a sledgehammer to their brain. At first glance Jason seems a little off, from there on its topsy turvy all the way through the numerous layers of madness. Though able to keep up a somewhat reasonable persona in the open he obviously does not belong in crowds, his giddy mannerism and emotionally immature personality coupled with zero empathy makes him dangerously unpredictable. He has his own opinion on how the world should be, he wants to claim his ‘rival’ Voirrey as his own. He seems superficially powerful and cruel, but has very childish or simplistic goals or motivations. Jason is very playful and usually puts on a smile. Despite being active on the battlefield as much as any character, Jason does not display any combat prowess. His forte comes in the form of his grand knowledge of magic and science. With his advanced army, he easily took control over Relliniana. Using his clockwork army, he crushed any resistance from the warlords at the Battle of Berick. Since the Category has no people stationed in the region, just how powerful his forces are, remain unknown. But it's not entirely clear what he imagines to be the purpose of this conquering and killing. A better world for the strong? The birth of a "superior" species? The fulfillment of some natural law? What makes him all the more dangerous, is that the fact that he's studied spells that allow for mind control. It seems that his magic influences humans more than they do faye. Jason has a strange marking on his hand, that may allow for him to access the high levels of prana involved to use such a spell.